I am blessed to have a Grandma who taught me how to sew by hand and by machine when I was a little girl. Some of my fondest memories are of sewing with my Grandma in her basement and proudly showing my parents whatever I made. As I have grown up, I realized that is is actually quite rare to know how to sew... and boy does it come in handy! Everything from fixing buttons, dog toys, hemming a pair of pants and fixing my friends clothes- being able to do some stitches and fix things has proven to be one of the most useful skills I possess. In college, all my friends would drop off the things they ripped to me to fix. I have saved countless dog toys with a few stitches. When my husband ripped his lunch box handle, I sewed it back on instead of buying a new one. It is a useful and rare skill that often saves me money. When a button falls off, I just sew it back on instead of buying a new one. Sometimes I find a great deal but it is a size too big- I can take it in and make it a perfect fit with just a few minutes on my sewing machine. Call me old fashioned but I am all for mending when I can instead of just buying a new one. Every time I see her sewing machine, I try to thank my Grandma for teaching me such a rare and valuable skill. The older I get, the more I enjoy and value cooking. I went straight from my parent's house and a home cooked meal every night, to living completely on my own in my first year of college. I skipped out on dining hall food (not sorry about that) but I also had to learn to fend for myself and cook pretty darn quick. I got really tired of Mac N Cheese pretty fast so, through trial and error, I slowly learned how to cook "real food". I would not call myself a master chef by any means but I am confident in putting a healthy, homecooked meal on the table for my husband almost every night. As I have grown more confident in the kitchen, I have found that adjusting recipes and trying out new things really isn't very scary or very hard. When my husband had to change to a gluten-free diet due to health concerns, at first I though I would never be able to keep him fed and happy with the new restrictions. 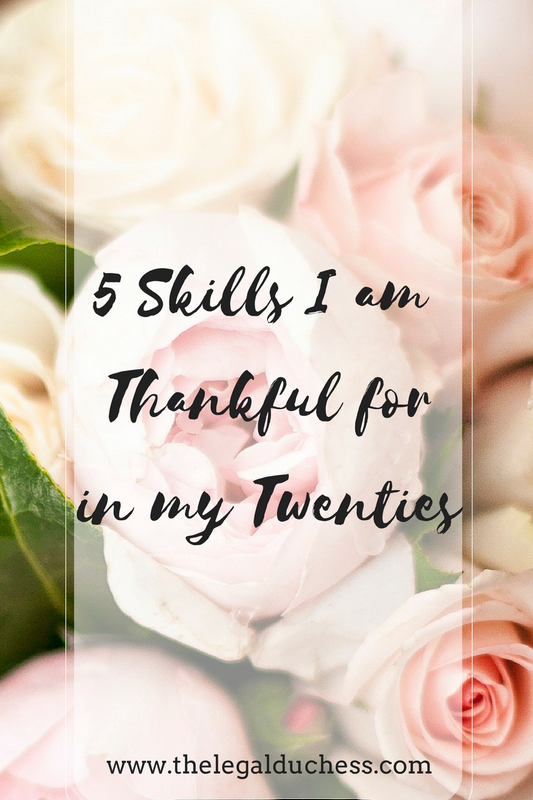 After a few weeks, I realized that my skills were far more than I had originally thought and I was able to adapt almost every recipe we loved to being Gluten free. Now, I 100% prefer to cook at home versus getting take-out or fast food; we have homemade Pizza, homemade stir-fry, homemade everything. We only go out to eat about 2-3 times a month and my husband does take over the kitchen usually once a week and I get a break. Other than that, it's just me and the kitchen and I have grown very confident in my skills. We have healthy, good dinners, healthy, filling lunches and quick, lasting breakfasts all thanks to a lot of trial and error and my decent cooking skills. I do not know how people get by without these skills but I am so thankful that I figured out how to cook sooner rather than later. Why yes, I do know how to use power tools. I grew up on a farm as the last daughter of a cowboy with no sons. Therefore, he taught me anything and everything I needed to know about maintenance, home improvement, power tools, etc. After we bought our house, my husband was working full time so any improvements, projects, etc. that needed done fell to me- and I was more than happy to do it because I knew how. I know how to install drywall, install a light fixture, fix the dishwasher, build a table, paint, hang trim, lay tile, lay hardwood floor, plant trees, trim trees, dig flower beds, build fence, attach a new doorknob, and the list goes on. There is something very fulfilling about being a woman who can do pretty much whatever I want around the house with no help from a man. If my husband is gone and something goes wrong, I don't panic because chances are, I can figure it out. I am so darn happy that my daddy handed me power tools and raised me as a little tomboy because now, I can do things all by myself. I was raised in a family that lived on a budget. Learning to shop frugally, stretch what you have, find deals and repurpose was a part of my upbringing. When we got married, I was not longer working and soon starting law school. We were (and are) a one income family and we have expenses: car payments, mortgage, cell phones, utilities, etc. My skills for stretching out budget have helped us to save a nice little rainy day fund and to have money left over for fun things, like a vacation to Maine this summer. Thanks to my upbringing, budgeting and finding deals comes naturally to me. I always look for and use coupons, I take a little extra time and shop at several grocery stores to get the best deals and I meal plan to make the most of what we have while not losing diet quality. Beyond groceries, I always do my research to find the best deal; recently we were looking for a new end table and we thought it would run us upwards of $100. I did my research and after a few weeks, came across a table for $34.99 and it is perfect! Just taking the time to research the best deal can save a great deal of money. I search for clearance events and try to be skillful; like buying Christmas decorations on crazy good sale in January and storing them until next year. This is a skill I know my husband particular appreciates because we do live on one income and therefore need to budget. We have plenty for what we need and want but every little bit I can help us save helps us to build our nest egg and have some extra cash for fun stuff. All my life, I have been a busy person. In High School, I juggled sports, job and honors classes. In college, I added more sports teams, clubs, a job, two majors and applying to law school. I have always been a juggler and time management is key to that. The older I get, the more things I have to fit in a day. Now it's school, homework, puppies, dinner, housework, laundry and husband. Learning how to manage my time and fit the utmost into a day is a skill I am very thankful for given how busy I am right now. I am a big fan of a to-do list to get the most done in a day and for budgeting my time out. This helps me to get the most out of my days and still have time to relax, blog, etc.